Welcome to my Northcote Xanadu. The wind is shimmying among the grasses, making the raindrops sparkle. I’ve lit candles, and switched on the lava lamp. It feels good to be home. 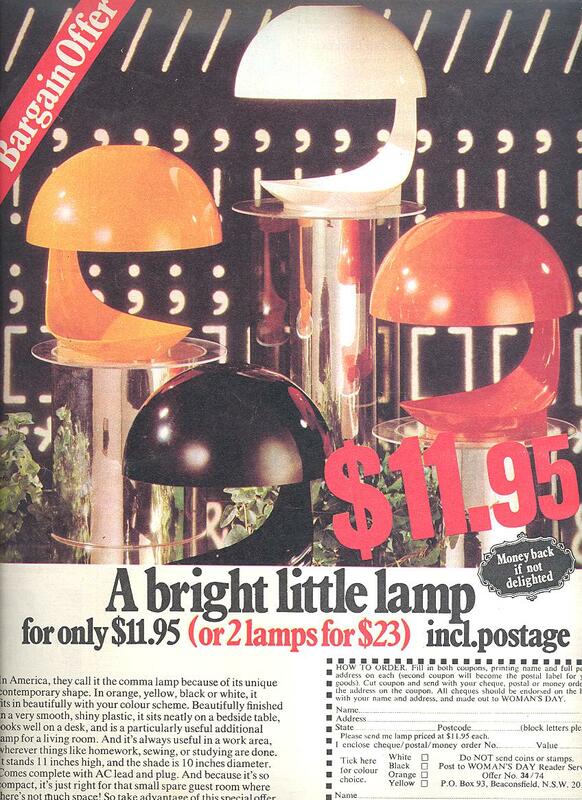 Not sure what to make of the Comma Lamp. I know it is a nifty lamp/storage bowl combo, with a unique, contemporary shape…The feature that really got my attention was the promise of “money back if not delighted”. Click the thumbnail and see what you think. Breathing Light, Nitin Sawhney. Soaring strings, expansive mood, builds slowly but surely. What a little moonlight can do, Billie Holiday. There is a light that never goes out, The Smiths. kj: Breathing light doesn’t actually mention light in the lyrics, or does it? Not so sure about Kylie either – she may make you travel in light years, but doesn’t do much por moi…The Smiths? Now there’s a top song. Well I guess it does mean light in the lyrics, considering that there aren’t any. I do love the notion of breathing light, though. The Pearl Jam lyrics are super cool. kj: well, yeh. aren’t they? breathing light is cool in the same way feeling colours or seeing music is. Light Enough To Travel, the Be Good Tanyas.